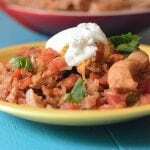 Great Cilantro Chicken altered from Gooseberry Patch's new Slow Cooker Fall Favorites. Optional: Shredded Cheese and Sour Cream for topping. Dump all ingredients into a slow cooker.